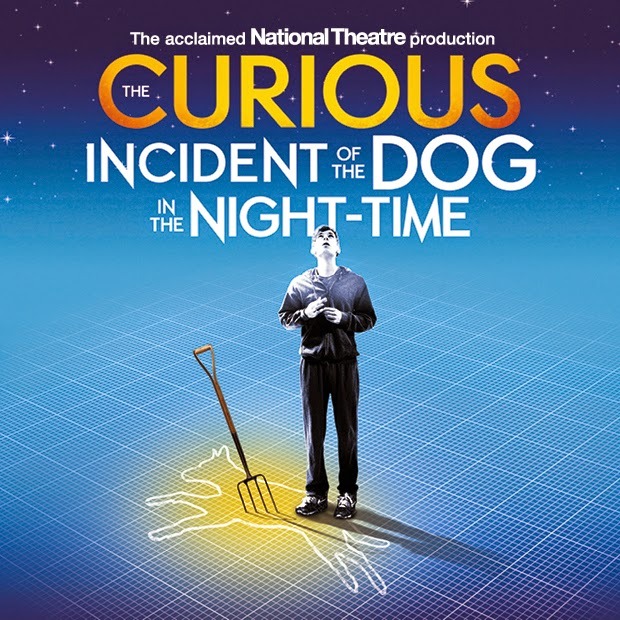 Based on the award-winning novel by Mark Haddon, adapted by Simon Stephens, directed by Marianne Elliott, and winner of seven 2013 Olivier Awards, this highly acclaimed National Theatre production is currently on its first ever UK tour. Having read the book after it won the Whitbread book award and thoroughly enjoyed it, I’ve been meaning to see the theatre version ever since it was first staged. So I was thrilled when the NT announced it would be touring and I realised it was coming to Wolverhampton Grand – going to the theatre after work always feels like the best kind of treat. My friend Cat, who was with me, had seen the NT live broadcast of this, and assured me I was going to enjoy it immensely. She was not wrong. The staging was both innovative, the script tight and effective, and the cast excellent. The staging is, as far as I’m aware, meant to take us inside Christopher’s head, giving us as much insight into his perspective as possible. This immediacy, of flashing lights and hundreds of words racing across the walls and the noise, took me by somewhat by surprise but also took me right to the heart of the story and just how the way Christopher experiences the world makes so much difference to how he interacts with it. This is something that book strives to get across, and does so well, but – at least for me – the written word only took me so far in my understanding and this experience made me “get it” in a way I hadn’t before. This was especially true during the scenes where he is going to London, navigating stations, tubes and people, which were deeply visceral and moved me immensely. The core of the story loses nothing in translation from page to screen but there are obviously some threads which run through the book that have been removed for expediency; for example Christopher’s love of Sherlock Holmes isn’t really touched up, references being limited to a few lines, only one of which is a direct mention of the man himself. This is not a criticism as such, just an observation, but I have to admit being a little sad that Sherlock was lost to such an extent, given the title of the play. The cast were, as I’ve said, excellent. Joshua Jenkins, who played Christopher, was spellbinding to watch and Lucas Hare, as Christopher’s father, took my breath away a few times with the palpable anguish emanating from him. I must also mention that the puppy who makes an appearance at the end was absolutely adorable (a yellow lab who looked to be about fourteen weeks) and incredibly well behaved. It was only thanks to the fact that Cat is a good influence on me that I didn’t go round to the stage door and demand a cuddle afterwards. Curious Incident is a powerful book and the stage version does it complete justice. The list of UK tour dates is here and I hope that if it’s coming to a town near you, you get the chance to go. Thank you for your kind words: however, the actor who plays Christopher's father is Stuart Laing, not me. I play Roger Shears.